I just adore this photograph! Isn’t it marvellous? The gloves! Those hats! 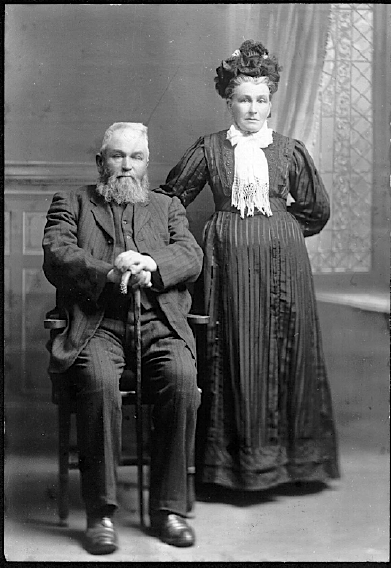 My great grandfather Peter looks quite the dapper lad, and my great grandmother Margaret so much the lady. 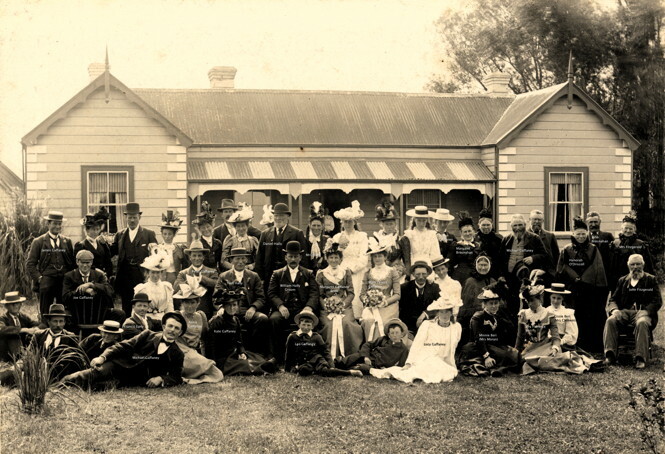 St. Patrick’s Church was the scene of an exceedingly pretty wedding this morning when Mr P. D. Gaffney, of Canterbury, was united in the bonds of matrimony to Miss Margaret Monica O’Rourke, youngest daughter of Mr B. O’Rourke, of the well-known Napier carrying firm. Pontifical high mass was celebrated by the Rev. Father O’Connor, in the absence of the Rev. Father Goggan. 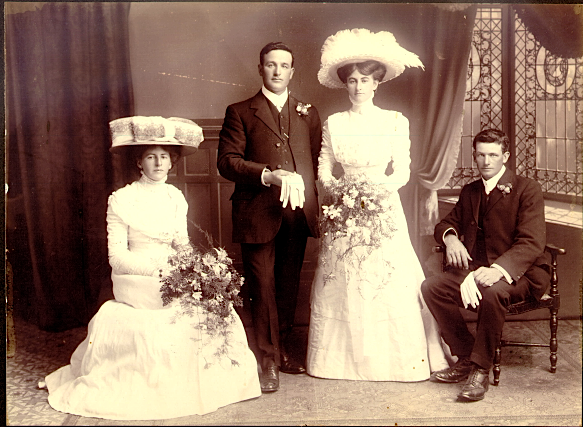 Mr James Gaffney, brother of the bridegroom, was best man and Miss B. O’Rourke, sister of the bride, was bridesmaid. The bride, who was given away by her father, looked charming in a princess gown of ivory chiffon taffeta, yoke of tucked net and trimmed with silk guipure. She wore a large cream picture hat of crinoline straw, with soft tulle ruchings finished at the side with soft flowing plumes. The bridesmaid, Miss B. O’Rourke, wore a pale blue ninon de soie, with yoke and sleeves of ecru net threaded with pale blue bebe ribbon. She wore a large Tuscan straw hat trimmed with cream tulle and embroidery. Miss K. O’Rourke was attired in a gown of cornflower blue eolienne over silk with a yoke of ecru net and beautiful Oriental embroidery. Mrs O’Rourke, mother of the bride, was attired in a gown of black silk, while Mrs McCallum, sister of the bridegroom, was dressed in a brown tailor costume with toque to match. The bride’s present to the bridegroom was a pair of gold sleeve links, while that of the bridegroom to the bride was a handsome ruby and diamond ring. To the bridesmaid he gave a handsome cameo ring set in pearls. New Zealand, birth certificate for Margaret Mary O’Rourke; 07 Sep 1885, Napier; citing 1885/18916, Births, Deaths & Marriages, New Zealand. Baptismal certificate for Peter Dominic Gaffaney; 16 Aug 1879, Temuka, New Zealand; copy privately held by [NAME, ADDRESS FOR PRIVATE USE]. New Zealand, marriage certificate for Peter Dominic Gaffaney and Margaret Monica O’Rourke; 09 Nov 1909, Napier; citing 1909/7835, Births, Deaths & Marriages, New Zealand.